A to-do list template is your first defense against the chaos of mounting tasks. It’s a way to take that onslaught of work and organize it, prioritize it and see at-a-glance when each individual assignment is due. This is how you start to manage workflow and create the beginnings of a schedule to help get things done on time. Get your free To-Do List Template! If you still need convincing about the value of using a to-do list, just look at your day. There’s a lot to do there, right? Whether you’re working or just living your life, there are tasks that need completion, bills that need to be paid, places you have to be, people you need to meet. The list can feel endless, which is why it’s best to have it physically written down, or better yet, collected in a template, so you can see the full picture. It should be clear now that a to-do list template will make you more organized. That means your work is more manageable, which means it’s more likely to get done. You have an outline to ground your actions, and it feels good to cross those to-do line items off your list. By putting something in a to-do list you have permission to forget about it, but, ironically, you are more likely to retain that information after you write it down. And even if you don’t recall what it was you put on the to-do list, it’s there for you to access at anytime. On the left-hand side of the document is a column titled “My Tasks.” This is where you’ll collect your tasks. Keep it simple. You only want to write a few descriptive words that sum up the work. Next you want to determine the duration of the task. That means, how long will it take? This column is the “Start Date,” which is when you begin the work. The column after that is the “Due Date,” which is when you have to have the work completed. Having these two point creates between them the duration, a crucial piece of information to help you plan your work accordingly. Finally, you have a column in which to collect any notes. While the task title should be brief, these notes can be more detailed and contain specific directions or issues that might arise as you work. You can add a new row if you need to add another task. The arrows at the top of the columns allow you to filter your tasks based on the data in the column (i.e., show me only tasks marked “done”). That’s it. Using a to-do list template is easy and helpful. Once you have filled in the title and dates, you’re on your way. To take your to-do list template to the next level, you’ll want to upload it to ProjectManager.com, where it becomes integrated with online Gantt charts, a real-time dashboard and other tools. 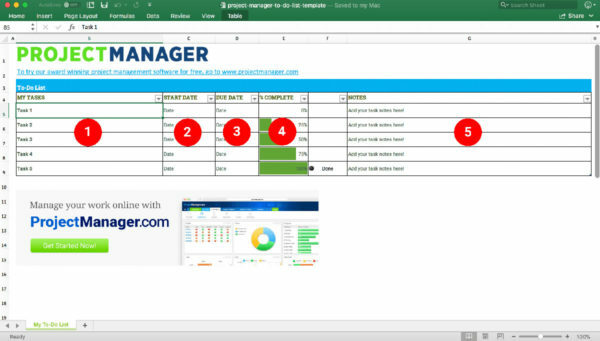 By importing the Excel spreadsheet into ProjectManager.com, all the information on your to-do list is automatically added to the Gantt chart, which populates those tasks to its timeline. There you can link dependent tasks and edit due dates as needed. Now your to-do list is super-sized. You can use it as a collaborative platform to work with others on your team, automate notifications to help remind you of impending deadlines and attach documents, links and other media directly to the tasks. A to-do list is only a tool, and it’s important to learn how to best use a tool. On the ProjectManager.com blog there is a wealth of resources to help, from blog posts to tutorial videos. Here are a few that will help you use your to-do list template. 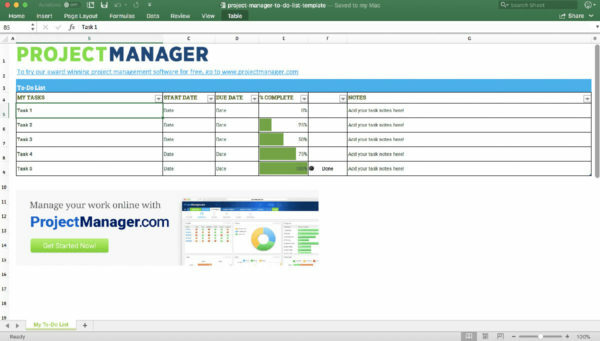 ProjectManager.com is a cloud-based project management software. Features include a real-time dashboard that gives you the most accurate view of the progress of your project. But more than a mere monitoring system, our dashboard makes generating targeted reports easy and sharing them simply, either online or in print. Learn how to schedule more efficiently with online Gantt charts that visualize the project timeline and allow for easy changes as you adjust resources. There are also tools for workload management, communications and more. See how ProjectManager.com can help you work more efficiently and productively. Start a free 30-day trial now.